The Moksha online counselling, therapy and consulting service was created to save you time while still delivering maximum impact to your ongoing treatment. Do you live outside the city, deal with a rigorous work schedule or simply feel more comfortable discussing personal subjects in your own home? If so, then this page contains information just for you. Over the last few years we’ve seen a steady increase in what we call “TD’s” or Time Demands in our client’s day to day lives. Simply put, that means today (more than ever before) there are more “things” fighting for and consuming your personal time. When you consider your time is one of the only things that is truly limited (ie. you cannot buy more of it like apples or tea), it becomes extremely important to budget your time for maximum personal benefit. However when you need to allocate large parts of your day to commute, meet with me and then return home or to work…. that 1 hour session effectively turns into 2, 3 or 4 depending on traffic, distance and a variety of other factors outside your control. It’s made worse if rely on public transportation, work an unconventional schedule or travel a lot… it can be nearly impossible to find the time to meet on a regular basis to achieve the progress you rightly deserve. Our new online counselling and therapy service was created to solve this problem by providing the same benefit of personal sessions with the convenience and portability of the internet. Due to the sensitive nature of our conversations, it was imperative that the software solution chosen met our strict privacy guidelines. Skype, Google Hangouts and other similar free programs are great to chat with Mom & Dad back home or your kids at University. But they are not nearly secure enough when it comes to counselling and/or therapy. Therefore we decided to use a health-related solution originally designed for health related government agencies. It’s fully encrypted so nobody can listen or watch unless you give them your password (so don’t!). You will receive a confirmation email with a special unique clickable link. On the date and time of your appointment you simply open that email and click the link. You will also receive an invoice that can be paid online. The invoice must be paid 24 hours before your online appointment starts otherwise the appointment will automatically be cancelled. If this is your first online appointment then after you click the link in the email your computer will download a free piece of software. Don’t worry though; this software is used to encrypt our conversation so nobody else can listen or watch. Allow this download and install. The cost of each hourly session is $180.00 (paid minimum 24 hours before the appointment or session will be cancelled). We do require five to seven days prior to your booked session to allot enough time to plan and provide your session and we require a twenty-four to forty-eight hour cancellation notice prior to your session. Unfortunately, you will be charged 50% of the session for the first time and for the full session any time after. It’s important that we both respect each other’s time. You will then receive a welcoming housekeeping message and some extra forms for you to fill out with your basic information. After these forms are completed, and payment is made in advance, you will receive a reminder email confirmation with your upcoming online session appointment. As your registered clinical social work therapist team, we are legally and ethically required to protect your privacy and confidentiality online and in person. With the exception of several rare situations (such as clients being at risk of harming themselves or others), we may be required to reveal the content of your conversations to others. If this ever does apply to you, we would inform you of the processes needed to help us prepare for this rare event. We will also discuss it briefly in our earlier housekeeping duties. Other than this exception, you are properly protected with encrypted software and the earliest legal and ethical protection throughout your journey with our services. Also, we are always looking to improve our knowledge, practice, and online services, so please feel free to contact us with any questions, comments, or concerns that you may have! We look forward to working with you and serving you with our best online therapy and counselling services available! 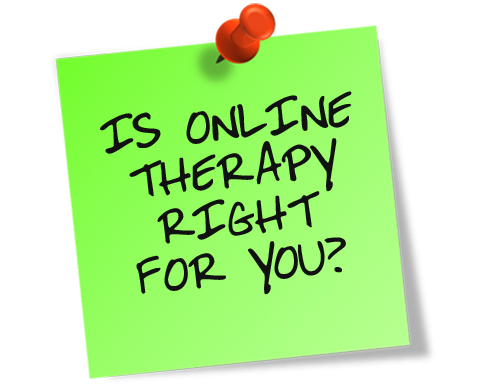 Online therapy and counselling has been shown to be an incredibly effective tool given recent advances in online communication software. But this does not mean the service works for everyone, to start with you must have access to a computer and a decent internet connection. Plus you must be able to get at least 1 hour of quiet, private, alone time during the online session. Of course these are just a few examples of how online counselling services can be both a tremendous benefit and time-saver. If you click the button below you will be taken to another page in order to complete a short information form. We will then promptly get in touch with you.